We aim to answer all questions within 48 hours. Q. What records are held for overseas births, marriages and deaths? A. Births, marriages and deaths registered by the British Forces and the British Consul or High Commission in the country where they took place, from 1849. Deaths that occurred in the Boer War and both World Wars. Q. Are all overseas births, marriages and deaths, involving British nationals held in the UK? A. No. Registering with the British authorities is not compulsory. It is not a service which everyone takes up. Q. I have a British passport, does this mean that my birth is registered or recorded in the UK, even though I was born abroad? A. No. 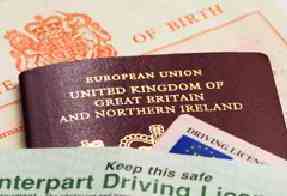 Having a British passport does not mean that your birth was automatically registered in the UK. Your birth may have been registered, by your parents, with the British authorities in the country of birth, but registering is not compulsory. Q. What certificates of overseas births, marriages and deaths can I order? A. You may place an order online for a full certificate of an overseas birth (which will include parent's details) a death certificate or a marriage certificate. Q. What records are held in the Adoptions Branch? A. Adopted Children Register: The Adoptions Branch maintains the Adopted Children Register (ACR). The Register contains the particulars of adoptions authorised by order of a court in England or Wales on or after 1 January 1927. The only information that is available from the Adopted Children Register is a certificated copy of an entry, which is the equivalent of a birth certificate for an adopted person.